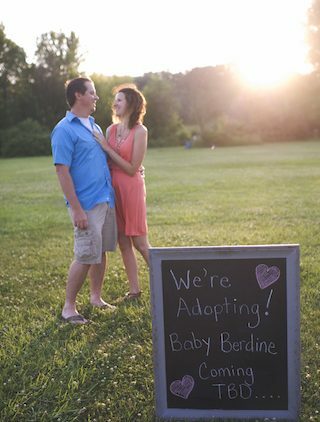 Bringing home Baby Boy Berdine! We are officially matched with a birthmom! Our baby boy will be born in two weeks! We still have some expenses toward the baby and birthmom that we don't have from our fundraising efforts two and a half years ago. We are beyond excited and are doing everything we can to be prepared to welcome a beautiful new life into our home. As part of our adoption process, we have started a crowdfunding campaign. It may surprise you to hear that adoption related costs can easily total up to $35,000 or more. This is why we have set a goal of $8,000 to help ease the financial burden that often overwhelms adoptive parents. We hope that by inviting you into this process, you will see yourself as part of the community we hope to build around our child as he/she grows up. Thank you for your generosity, prayers, and support! 1 Samuel 1:27 For this child i Have prayed and the Lord has granted the desires of my heart. May the Lord bless you in this new life adventure! What a joy to be able to give Baby Berdine a loving Christ-centered home!